In response to your requests, please find below a place for pantomime enthusiasts to hire pantomime items or sell pantomime memorabilia directly with each other. We are certainly not trying to compete against other auction sites and, aside from putting the items on the page, we accept no responsibility for any transactions which take place as a result of items placed on this page. If we find or are told that this board is being abused then we will withdraw it. via its Postal Donation form, which can be downloaded from here. PLEASE SUBMIT YOUR ITEMS BY EMAIL TO SIMON - INCLUDE AS MUCH INFORMATION AS POSSIBLE, AS WELL AS PHOTOS IF AVAILABLE. PLEASE PROVIDE AN EMAIL ADDRESS, PHONE NUMBER AND ADDRESS - ONLY YOUR EMAIL ADDRESS WILL BE PUBLISHED ON THE SITE WITH YOUR LISTING. 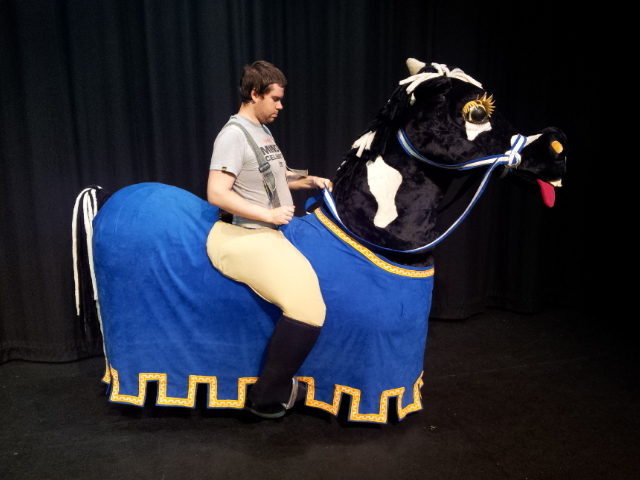 This is a large, extremely light weight horse costume/prop, for one person. The wearer stands inside the horse, and the body of the horse hangs from straps from the persons shoulders, there are fake legs attached to give the illusion the person is riding the horse, there is a skirt to hide the wearers real legs. 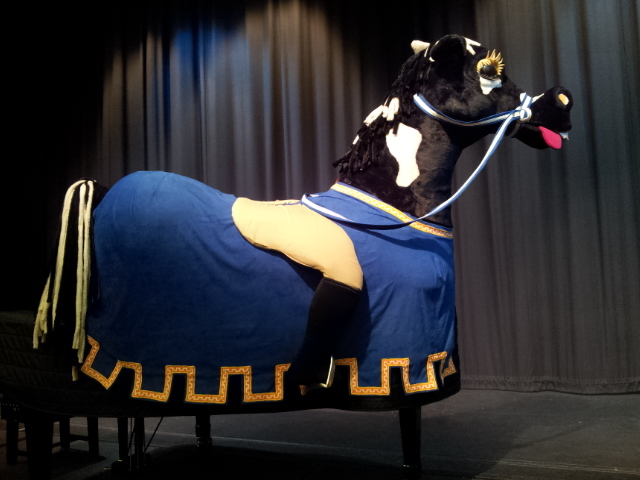 The head of the horse is removable for transport and storage. 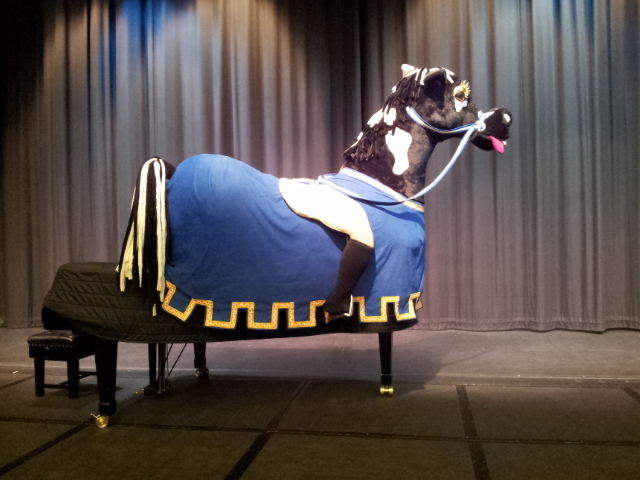 The horse is photographed sat on a 6'6" grand piano, so to give some idea of scale and size. The buyer must arrange transport, it will fit into a people carrier style car, or a short transit van. I am in Hull, East Yorkshire. This is a dress in the style of a pile of boxes (or Christmas presents), it is in three parts, skirt, bodice, and wig dressing (but these could be mounted on a hat). 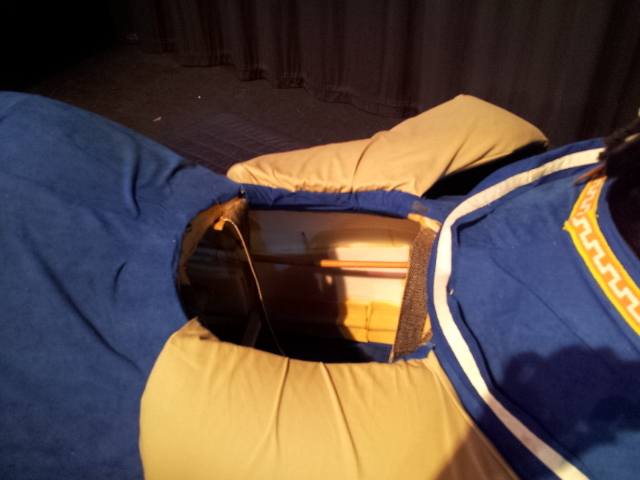 It is very light, as it is made from dense foam board. There are a few white tiny dots on one side of the skirt. Buyer to arrange transport / collect in person, it would fit in a large car. Remember, the wig, under body/suit, and boots are not included.